While I am a fitness professional certified in multiple specialties, my scope of practice is limited to the instruction of in-person group fitness classes. Any information or advice posted on this blog is to be taken/used/followed at your own risk. Use common sense, do your own research and consult with your doctor before starting/changing your workout or nutritional habits. The tips, workouts, recipes and other content on this blog may not be suitable for all individuals. It is important to work with your doctor, or other health care professionals to determine what the right course for action is for you. The reader is to be aware there may be risks inherent in changes to physical activity or diet, including but not limited to severe personal injury and death. The writers, contributors or any others associated with "Fitness with Jill" shall not be held responsible for any and all claims, costs, liabilities, expenses or judgments, including but not limited to attorney's fees and court costs (collectively "Claims") arising out of use of information on this site. The writers, contributors or any others associated with "Fitness with Jill" shall not be held responsible for risks or incidents resulting from following any information found on this site, including but not limited to personal injury and death. Visitors who use/relay on information on this website do so at their own risk. Information on this site is for entertainment and interest only, and is not a substitute for professional health advice. Information on this website is not intended for individuals under the age of 18 years and shall not be used/viewed by those under the age of 18. Writers, contributors, and "Fitness with Jill" are not responsible for any user content that may appear on the site such as but not limited to reader comments. Considering taking a fitness class, but not sure if you're ready? 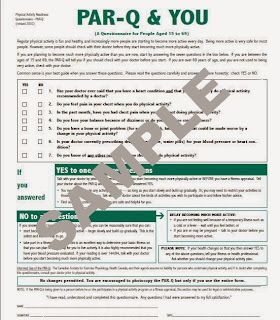 A great place to start is with the PAR-Q Physical Activity Readiness-Questionnaire. It can be found here If you answer 'YES' to any of the questions, consult with your doctor as per the instructions on the form. This form should be used in conjunction with good judgement, professional healthcare, and your individual medical history.